I always look forward to Thanksgiving. I love spending time with family, I love the food, and I love that it kick starts the holiday season. I always get up early in the morning, make the dishes I always bring: homemade salsa and 7-layer salad and then get dressed in a festive outfit for a fun-filled day eating, socializing and scouring the ads for Black Friday deals. I always wear something festive to our holiday get-togethers. As I was shopping for my outfit for this year, I saw so many cute t-shirts for every member of the family. 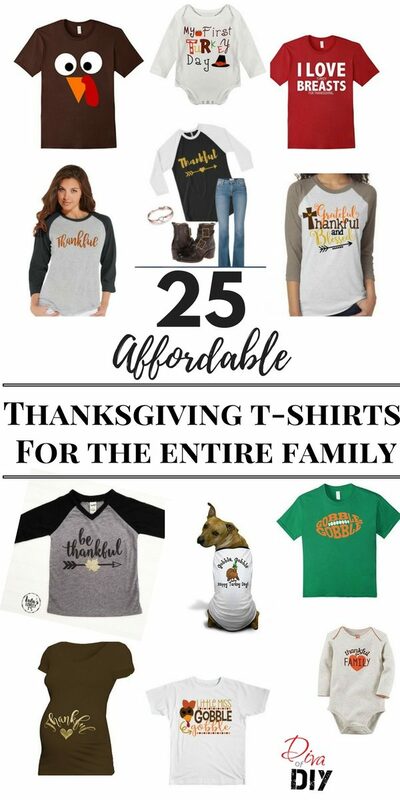 That’s when I got the idea to share 25 of my favorite picks for Thanksgiving Day! Having a new baby is so special and I know celebrating every “first” is photo-worthy so here are 3 newborn outfits perfect for celebrating that special day. Let the big brothers and big sisters so their pride with their own festive announcement t-shirt. Oh my gosh, I love these “mommy-to-be” t-shirts. These are perfect for the expecting mother who wants to make a surprise announcement, who is newly pregnant and has been chomping at the bit to get in some maternity clothes or a woman 9 months pregnant who is about to burst! When I am shopping for my festive t-shirt for Thanksgiving, I am looking for a style/comfort combo. All five of these shirts fit the bill. Can you guess which one I chose? Is your guy not so excited about wearing a festive tshirt? Try one of these on for size…these are right up my husband’s alley. and we can’t forget out 4-legged friends. They will look adorable all decked out for the holidays. I hope you’ve enjoyed these festive t-shirt ideas. I know this isn’t my normal post but it’s fun sometimes to mix it up.